Panto star David McClelland enjoyed his stint in Panto at The Deco so much last December, he jumped at the chance for a swift return to appear in the Northampton. He appears in the theatre’s spring spectacular, Aladdin running from April 7-9. 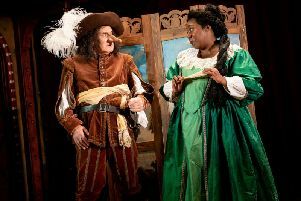 "I had a fantastic time in Northampton in ‘Snow White’ at The Deco last Christmas, working with, and for, a great group of people, and performing to fantastic audiences," he said. "Asked if I'd come back for 'Aladdin' I had no hesitation, and am looking forward to teaming up again with Nick (Cochrane), Colin (Ridgewell), Clive (Fletcher) and Naomi (Wilkins), great entertainers, all, and some new faces too. "We've got another great show lined up, and I'm really looking forward to being back in Northampton, and back at the lovely Deco, which is a terrific theatre; very homely, with a lovely, friendly atmosphere." Indeed, since finishing the run of 'Snow White', he has been busy working in that role, and has just returned home after a busy schedule filming for the BBC consumer TV show '#RipOffBritain' which he presents with Angela Rippon, Julia Somerville, and Gloria Hunniford. And as a welcome distraction, David is also very excited that his football team, Leicester City, has reached the quarter-finals of the UEFA Champions League. "Absolutely delighted," he said. "It's been a bumpy ride recently, after the amazing experience of winning the Premier League.